The rain this summer has been uneven at best. We had several weeks with highs of 100 degrees only broken by storms that threatened our electrical system. The week of Hurricane Isaac, the weather forecast predicted a 75 percent chance of thunderstorms every single day. However, it only rained one day at my house, for barely a sprinkle. Other weeks brought pouring rain, somehow always coinciding with me being outside. Anticipating more unpredictability, I made good on my long-standing goal to install a rain barrel. While the rain barrel might not provide all of the extra water the garden needs, it can certainly limit the amount I need to use the hose. Water conservation and pollution are particularly important in our area because we belong to one of the nation’s most economically important and threatened watersheds – the Chesapeake Bay. We’re also part of the Potomac River’s watershed. Although pollution has substantially fallen over the years, the “nation’s river’s” water quality could still be a lot better. Collecting rain reduces the amount of water I need to draw from the aquifer and the amount that runs over paved surfaces into the sewers. Before buying the barrel, I had one major concern – participating in the Rainscapes program. Rainscapes is an initiative that both my county and town run that offers financial incentives for people who install water-saving measures. (D.C. has a similar program, called RiverSmart.) While the qualifying projects differ between the municipalities, they provide rebates for rain barrels, conservation landscaping / rain gardens, and planting trees. Browsing the Aquabarrel website, which was both a local company and recommended by Rainscapes, I considered a number of options. Chris wanted something reasonably attractive and didn’t want to fuss with do-it-yourself options. I wanted one that wasn’t terribly expensive and maximized functionality. Although we originally considered the Planter Rain Barrel because of its look, its high price combined with the shipping cost made it difficult to swallow. We finally settled on the 60 gallon Rainstation instead, which looked easy to set up, came in an inoffensive tan color, and was just the right size for our needs. Rather than paying through the nose for shipping, I decided to pick it up myself. About a half-hour and several backcountry roads later, I pulled in the owner’s driveway. I talked to the co-owner, who helped me schlep it into the back of my car. Thank goodness for hatchbacks. As always, I appreciated the personal touch and community of ordering from a local business. We finally got around to setting it up about a week ago. 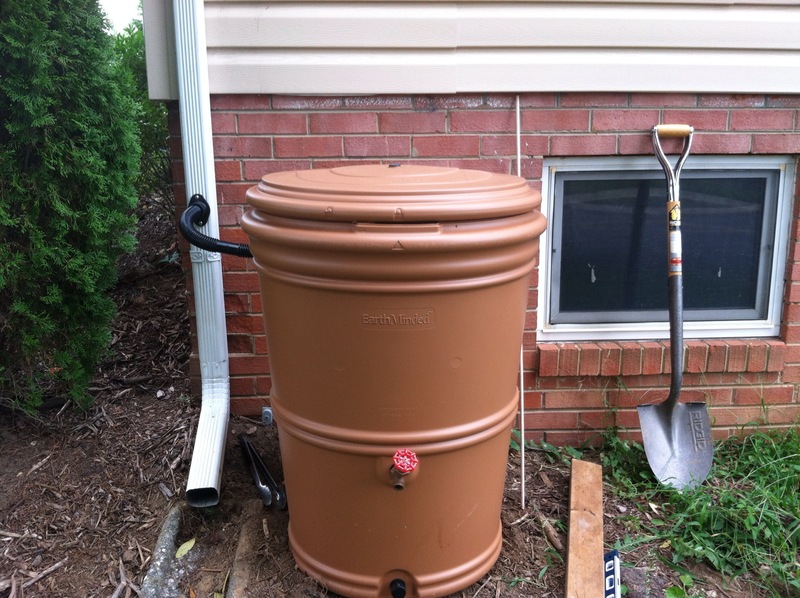 Our first step was assembling the rainbarrel. 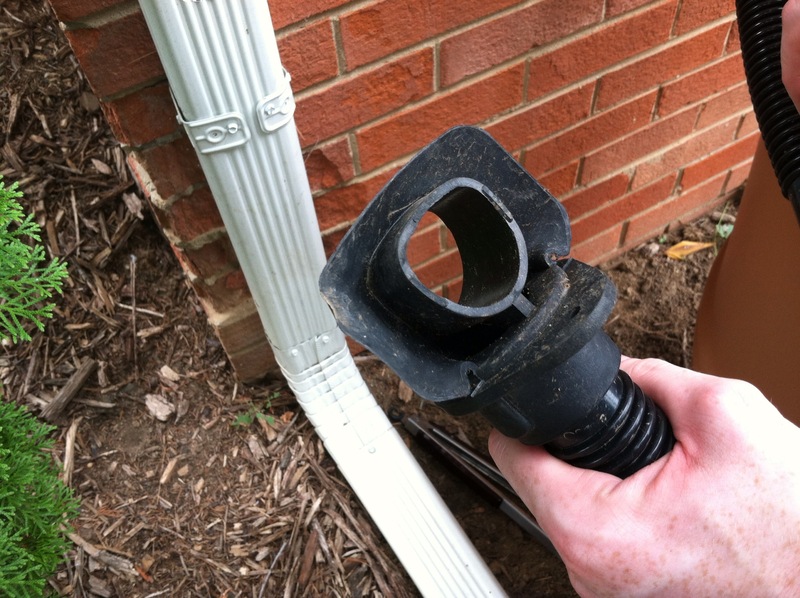 Fortunately, it came with all of the necessary components – the spigot to fill watering cans, the bottom drain to hook in the hose, and the water inlet to connect to the rain gutter. Basically, we just had to screw them all together. Then, we chose and prepared our site. We have three main areas where the gutters drain into the yard. Unfortunately, the place nearest the garden features an abrupt slope. We picked the next closest site, then shoveled it out to ensure the barrel wouldn’t tip over. 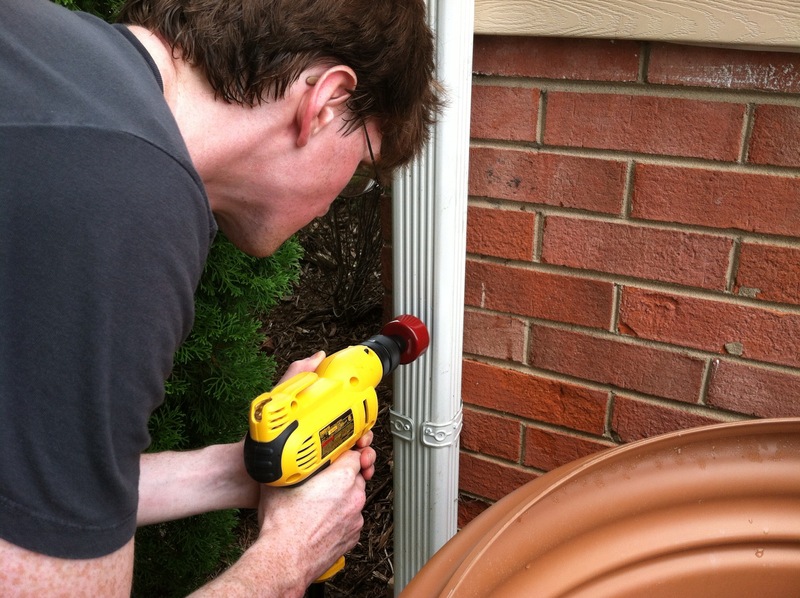 The trickiest part was next – drilling a hole in the gutter. We used a level to line the barrel up with where we wanted to drill the hole. If the barrel is higher than the hole, the water pressure will be too low and won’t flow into the barrel. If the barrel is lower than the hole, the water pressure will be too high and the barrel will overfill. We then attached the circle bit that came with the kit to our electric drill, spun it a couple of times, and drilled into the gutter. Unfortunately, we drilled just a little too long – and pushed the piece we had just cut, along with the circle bit, right into the gutter. We stared at it for a moment, then tried three different methods to fish it out without sticking our hand into the razor-sharp hole. Once we got it out, we stuck in the “FlexiFit Diverter,” a rubber piece that allows some water in the barrel and some to flow through the gutter. We finished the whole thing off by attaching the diverter to the barrel with the hose. To ensure no small child or animal would climb in, we locked the lid. So far, it’s been simple to use. I filled my watering can up 10 or 12 times yesterday and hardly saw a dent in the water level. We’re going to hook up the hose next, which should be very helpful as we finish out the fall growing season. 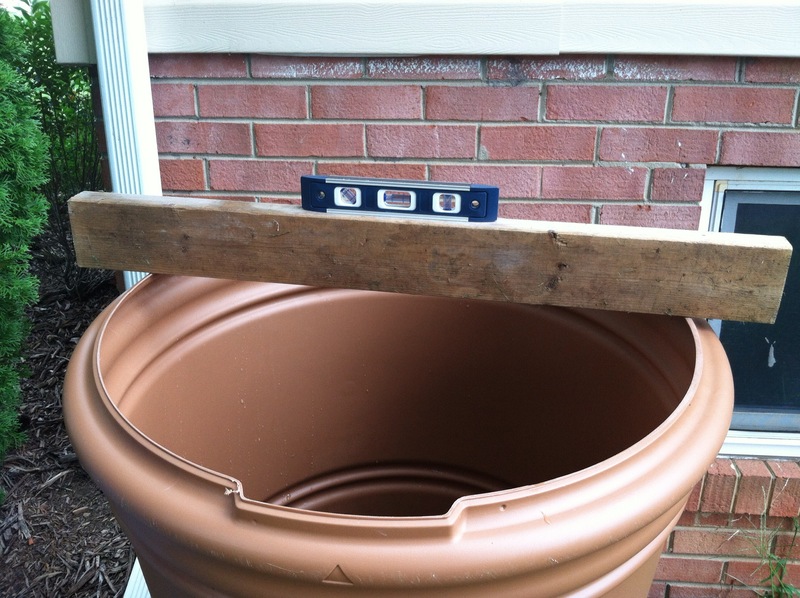 This entry was posted in food, gardening and tagged gardening, permaculture, rain, rainbarrel, saving water. Bookmark the permalink.